Kevin sat amid the heat, smog and noise that envelops the H-1 underpass on Harding Avenue in Kaimuki, surrounded by his bike, a few bags of belongings and glass bottles he’s collected for recycling, as cars sped by. 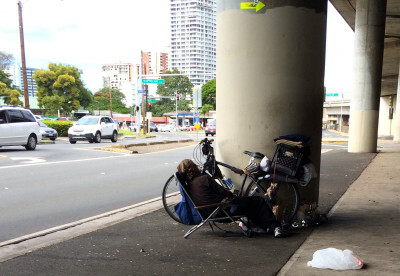 He’s one of an increasing number of homeless people who can be seen lining the sidewalk under the bridge since a series of laws banning sitting and lying on sidewalks and pedestrian malls went into effect in recent months throughout highly visible tourist and business districts on Oahu. 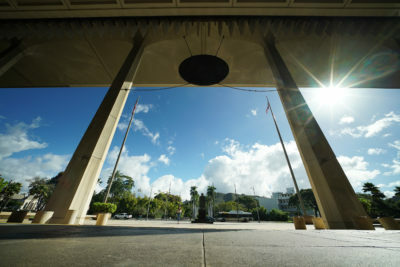 The laws, supported by Mayor Kirk Caldwell and the majority of the Honolulu City Council, are aimed at prodding people like Kevin into shelters where they can get needed services. The measures are also intended to move them out of view of tourists and shop owners who have complained that they are hurting business. 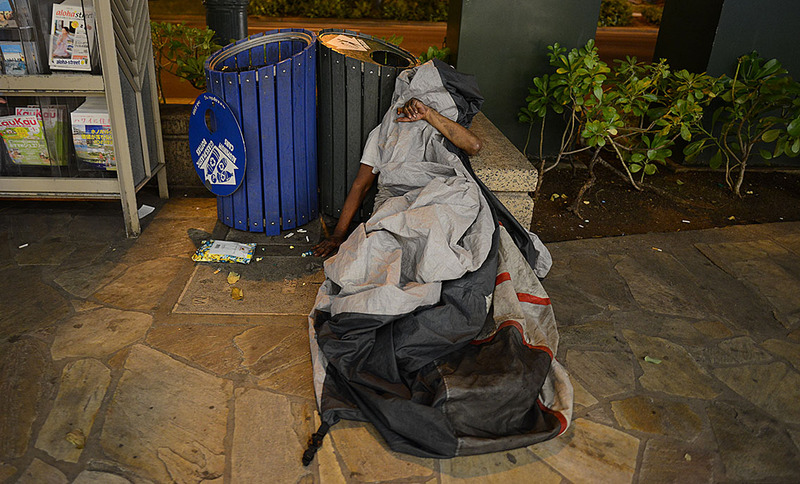 A tarp covers a man as he rests along Kalakaua Avenue. Instead, the laws appear to be pushing the homeless not into shelters, but less visible areas of Oahu, like under the H-1 bridge. Kevin, who declined to give his last name, says he’s never considered trying to get into a shelter because of all the rules and “bad things” he’s heard about them. Kevin appears to be the norm, rather than the exception, when it comes to the effect of the sit-lie laws, as well as a host of other city efforts to move the homeless into shelters, including the enforcement of nuisance laws such as bans on public intoxication and sleeping in parks, and the confiscation of belongings. Statistics compiled by PHOCUSED, a nonprofit organization serving Hawaii’s poor and underserved, show virtually no change in vacancy rates in emergency shelters throughout Oahu from late September, when the city began enforcing the sit-lie ban in Waikiki, until now. 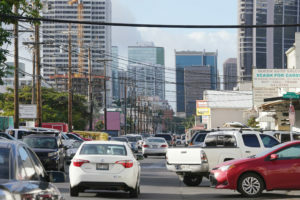 Subsequent laws banning sitting and lying on sidewalks in Oahu business districts took effect in December, and a ban on sitting and lying on pedestrian malls in downtown and Chinatown took effect this month. In fact, there’s been a slight increase in available beds — about 128 before the laws took effect and 143 as of mid-February. 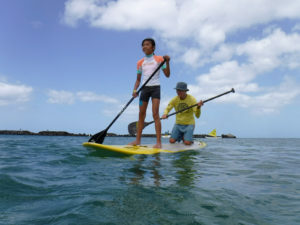 The statistics also show that there isn’t anywhere near the shelter space needed to accommodate the estimated 1,500 homeless people living on the streets, under bridges and in the parks of Oahu. On any given day, there are only about 100-150 open beds in emergency shelters. Meanwhile, city efforts to create permanent housing for the homeless have moved slowly. The City Council appropriated about $42 million for Housing First last June, which is expected to go toward housing long-term homeless people often suffering from drug and alcohol dependence and mental illness. In the past eight months, the city has moved 31 people into housing. Ultimately, the Caldwell administration hopes the funding will help house about 500 people. The administration also planned to create a temporary camp on Sand Island where homeless people could stay in tents while awaiting permanent housing. 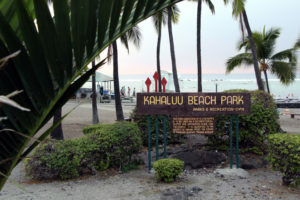 The plan helped push through the mayor’s bill banning sitting and lying in Waikiki by appeasing City Council concerns that the homeless wouldn’t have anywhere to go. The encampment was supposed to be up and running by December, but contamination concerns at the industrial site have hampered efforts. Fenix Grange, a supervisor at the state health department’s Hazard Evaluation and Emergency Response Office, said the department took samples for contaminants such as arsenic and lead at the site earlier this month and expects results back in about a week. She said that the biggest concern is young children’s exposure to the soil. The statistics provide by PHOCUSED paint a very different picture about the impact of the sit-lie measures than that presented by Caldwell during his 2015 State of the City address earlier this week. 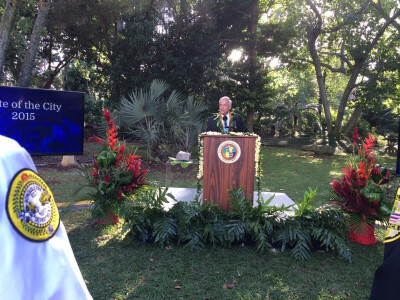 The mayor declared the laws a success as he spoke to a crowd of about 150 invited supporters and high-level government officials in Foster Botanical Garden in downtown Honolulu. Jesse Broder Van Dyke, a spokesman for the mayor, told Civil Beat by email that the Institute for Human Services and Next Step Shelter have seen an increase in demand for services. Mayor Kirk Caldwell delivers the 2015 State of the City address at Foster Botanical Garden. “We are proud to partner with emergency shelter and service provider agencies like the Institute for Human Services, Next Step Shelter, US Vets, and others across our island to take on the challenge of housing and providing for our homeless community,” Broder Van Dyke said by email. 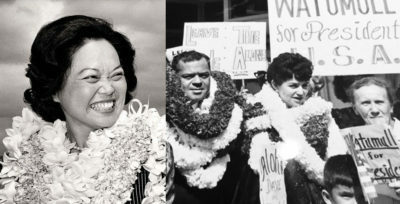 The Institute for Human Services, the largest shelter on Oahu with about 300 beds, had about 50 available beds for single men before the ban took effect. 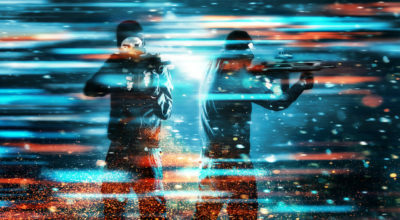 The vacancy level actually increased slightly in the months after enforcement began. There are now about 40 available beds. For single women and families, there has been zero availability since September, according to the statistics. The statistics contradict statements that IHS Executive Director Connie Mitchell made to the media earlier this month. IHS has supported the city bans. The IHS communications staff didn’t respond to Civil Beat’s requests for an interview with Mitchell. He said that one would have to look at how many people cycled in and out of the shelters daily and were placed in housing. While IHS collects that data, Carvalho said that it would take a lot of time and research to compile it. Correction: A previous version of this story said that IHS does not have data on homeless entering and existing its shelters. IHS does have the data, but Carvalho said it would take time to provide it. Waikiki Health’s Next Step Shelter has about 174 beds and is almost always near capacity. In January and February, the vacancy rate has hovered around 4 to 5 percent, the highest it’s been since September. 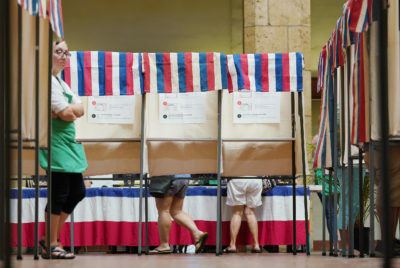 Michelle Ip, a program supervisor for Waikiki Health, said that the ban in Waikiki has primarily displaced the homeless, who have scattered to other areas. She said it’s made it harder for workers to locate their homeless clients. “All the time it’s taking to locate them because they have been displaced could be time we are helping others,” she said. River of Life shelter in Waipahu has about 85 beds. The shelter had a 28 percent vacancy rate in mid-September. It’s currently about 50 percent. 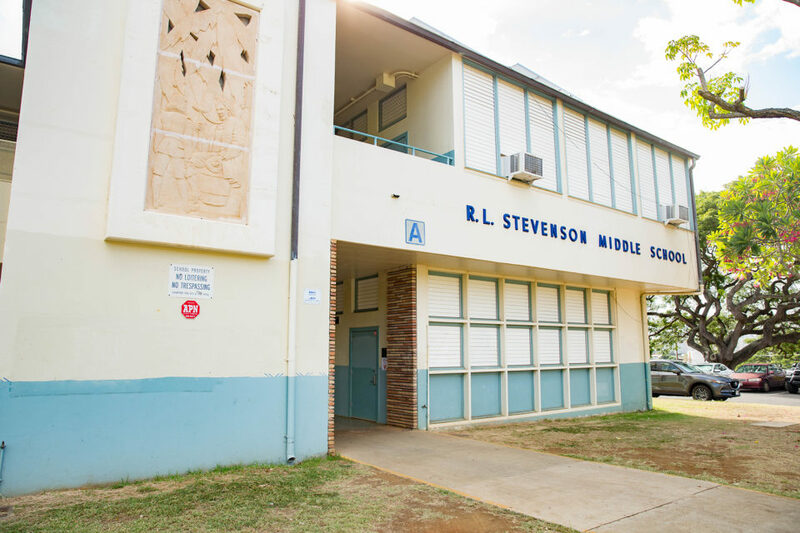 Shelters in Waianae also haven’t seen downward trends in vacancy rates. Gladys Peraro, executive director of U.S.VETS – Waianae, which runs a 100-unit shelter that serves both veterans and non-veterans, said that the sit-lie bans haven’t had any effect on the demand for shelter space. The vacancy rate at the shelter has fluctuated from 5 percent to 19 percent since September, and is currently about 11 percent. 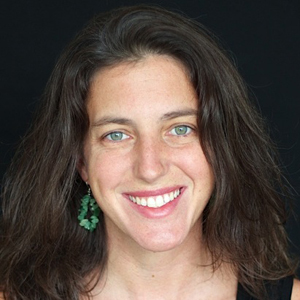 Peraro noted that the sit-lie bans primarily affect the urban core, not the leeward side of the island. It can take homeless people two hours by bus to get out to the Waianae shelter. Raina Whiting, a homeless outreach worker for In the Streets, isn’t surprised by the statistics. “I think that the biggest thing that sit-lie has made happen, is it just displaced people from one area and then pushed them into another,” she said. 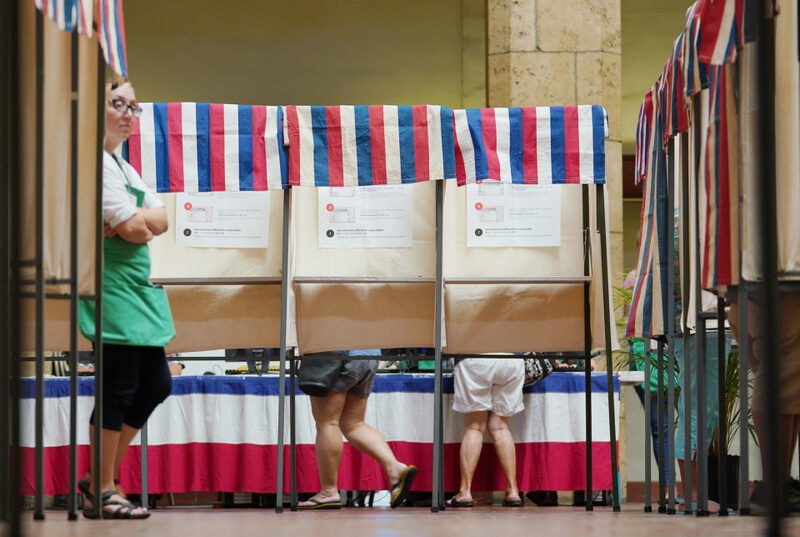 Whiting said that the number of homeless in Kakaako and along Kapalama Canal, where the bans aren’t in effect, have risen sharply. With long-term housing solutions slow to materialize, she said families are particularly hard hit given the lack of shelter space. She said some of the families have been kicked out of the shelters after hitting two-year limits, while at the same time awaiting public housing that has an eight- to 12-year wait time. Kevin, who has been homeless since 2010, sits in a chair under the H-1 freeway on Harding Avenue. “It’s just a way of criminalizing (the homeless) and creating a false solution to the problem,” she said of the sit-lie laws. Since the ordinances took effect, the Honolulu Police Department has issued 1,961 warnings, 126 tickets and made five arrests, according to the mayor’s office. As Kevin sat amid the traffic on Harding Avenue, he complained about the police sweeps of belongings and teared up as he spoke of his aging mother in Georgia who he hoped to one day go stay with. Both of them are excellent Scrabble players, he said. The city swept the underpass two days ago, which had little effect on Kevin, who says he has lived in Hawaii for 27 years and became homeless in 2010 after losing his job. He went around the corner to the bus stop as city workers loaded up unattended tents and belongings into Dumpsters, and then was right back in his spot when they left.